I really do appreciate every single customer that chooses to order Stampin' Up products from me. As a little way of showing my appeciation, I send out a little thank you gift each month and always make some special packaging. This month I came up with this box to house a roll of washi tape which I sent to each customer along with the Merry Medley stamp set. 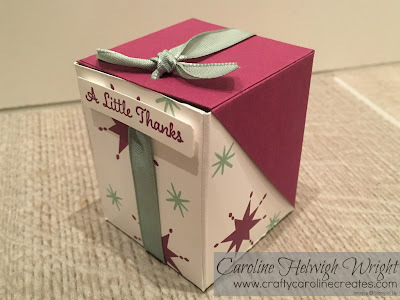 I've used my favourite Star of Light stamp set here but I don't think it looks overly Christmassy because of the colours used, Rich Razzleberry and Mint Macaron. What do you think? Christmas or not Christmas? 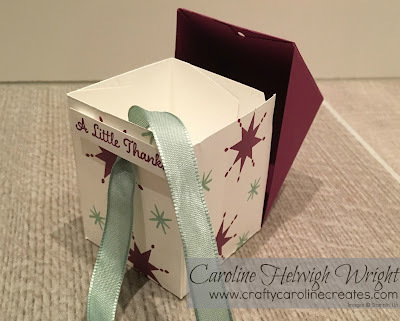 If you would like a closer look at the box, and to see exactly how it is made, click HERE to view my YouTube video. If you would like to recieve a gift like this through the post next week, just place a Stampin' Up order selecting me as your demonstrator. You can shop 24/7 at my online shop HERE, or email me at craftycarolinecreates@gmail.com and I would be delighted to help. Score short side at 2 and 4 inches. 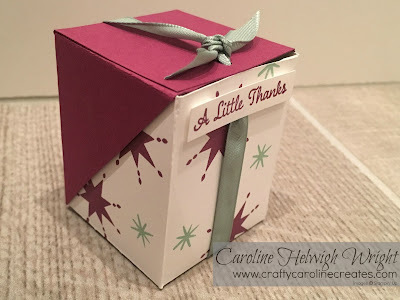 Very nice box, thank you for sharing the video!